Calcium, Magnesium and Potassium with Boron and Vitamin D, a synergistic combination macro-mineral supplement, for healthy bones, strong teeth and help in lowering blood pressure. 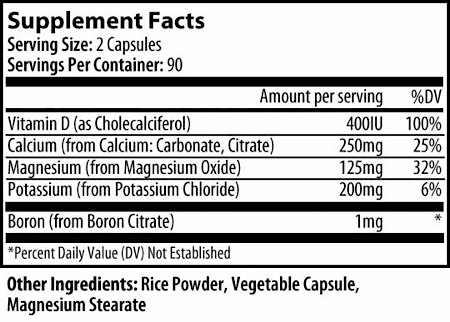 Magnesium, considered a Master Nutrient, is vital for the utilization of Calcium, the uptake of Potassium & the transformation of Vitamin D.
CAL-MAG-POT (Calcium - Magnesium - Potassium) with Boron and Vitamin D is a synergistic combination macro-mineral supplement that works to promote healthy bones, strong teeth and helps prevent Osteoporosis. Studies indicate that proper macro-mineral supplementation can also assist in lowering blood pressure. Customers report that this formula has also been helpful for alleviating leg cramps and swollen ankles and feet. SUGGESTED USE: Take 2 or 3 capsules 2 times daily with food. Be careful: If you are taking other products which contain magnesium, you can produce loose bowels from an excessive intake of magnesium. Magnesium deficiency is one of the most overlooked health problems in the western world today. Lack of magnesium mimics a host of health problems such as fibromyalgia, back pain, tendonitis, osteoporosis and an array of other so-called 'incurable' health problems. One of the little known reasons that magnesium deficiency causes such a variety of health issues is that this 'Master Nutrient' is utilized as an enzyme by a multitude of nutrients in a variety of cellular processes. Magnesium is such an important nutrient that taking it by itself, in many cases, actually raises blood levels of calcium, potassium and vitamin D.
How Does Magnesium Help Calcium to Work? Unlike drugs, nutrients require a complex array of substances in order to work properly; one of the best examples of this phenomenon is calcium. Women in western countries have some of the highest rates of osteoporosis despite having the highest calcium intakes in the world; while Peruvian and Japanese women, who get far less calcium but plenty of magnesium, have extremely low rates of osteoporosis. While magnesium is vital for the utilization of calcium, it also plays unique roles in the uptake of potassium and the transformation of vitamin D.
In the case of potassium, there are several studies showing that magnesium alone can improve low potassium levels. This is particularly dramatic in certain extremely ill hospitalized patients who continually have low potassium levels despite large amounts of intravenous potassium. Many hospitals have created protocols that require simply giving a dose or two of magnesium in order to solve this potentially life-threatening electrolyte imbalance. An even more urgent reason to get sufficient magnesium with vitamin D, however, is that it 'uses up' magnesium, which can actually create overt deficiency symptoms quite rapidly. In fact, the majority of 'side effects' that people experience when taking vitamin D, are actually magnesium deficiency symptoms that can be completely resolved with the addition of magnesium. With the multitude of actions it exerts on so many diverse physiologic systems in the body and the increasing amount of scientists, doctors and everyday people who are taking notice of the ever increasing body of research, magnesium is slowly but surely earning its rightful place in medicine as the body's Master Nutrient. Kerri Knox is a Registered Nurse, Nutrition Consultant and Functional Medicine Practitioner. Her private practice, Easy Immune System Health, focuses on helping people overcome chronic health problems through nutrition, supplementation and advanced laboratory testing techniques. You can contact Kerri and browse her extensive educational website.